Pour diced tomatoes into a large bowl. 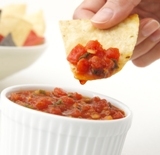 Add Salsa Seasoning (5.8 oz). Stir until well blended. Cover and let sit at room temperature for 30 minutes. Stir prior to serving and store in refrigerator.